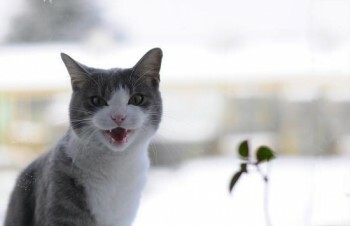 Does it appear that your cat is hungry all the time? Does he want to eat, no matter when you last fed him? 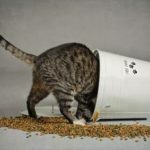 In this article, we are going to discuss possible causes and, most important, solutions for addressing excessive eating in cats (also known as polyphagia). Remember, polyphagia itself is not a disease. It’s a symptom, either behavioral or medical, of another issue. In order to fight it, you must find the source. Have your veterinarian examine your cat thoroughly. Common medical reasons that may cause a cat to be hungry all the time are worms, diabetes mellitus, tumor, insulin shock, and many others. Very troubling is when a cat eats excessively, but loses weight simultaneously. still loses weight. 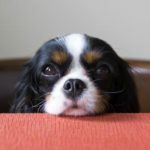 Most veterinary handbooks list about 10 to 20 health conditions that may result in polyphagia. Kittens and lactating female cats might also have an increased appetite. If the veterinarian diagnoses your cat with a disease, appropriate treatment must be started. In many cases, treating the disease is all it takes to stop your cat from being an excessive eater. 2. Is your cat getting enough food? 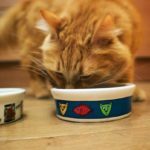 Is your cat getting enough food daily? Are your cat’s meals spaced evenly apart from one another? First, take a look at the label on your cat’s food, and find the correct amount to give your cat daily according to his weight—his normal weight, that is. Divide this amount into three to four meals and make sure you present them on a strict schedule. Yes, look at a clock. Feed your cat several meals per day, strictly at the same time. No extra treats! 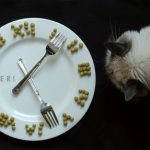 It will create predictability for your cat, which means that, if a meal comes at 10 o’clock, there is no reason for him to beg for it at 8 o’clock. Provide your cat at least three meals. If you have been feeding your cat at 2 o’clock, you simply cannot blame your cat. Twelve hours is a huge time to wait, given the fact that cats naturally eat up to 10 meals a day. 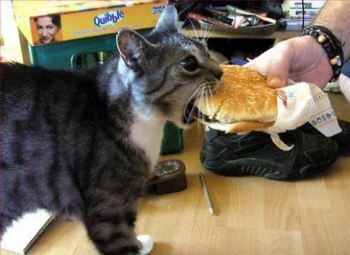 In nature, cats normally spend most of their day gathering food. They hunt small rodents, and after they capture and eat one, they groom themselves, take a nap, wake up, and start thinking about capturing another one. Household cats, on the other hand, do not need to gather food. It is readily available. If household cats do not have something to fill their time, they may start “gathering food” by purring and meowing at their owners. So what should you do? 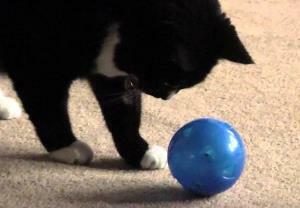 A treat ball is a great solution if a cat begs for food constantly. Photo from YouTube video by riccij. Our clients have achieved good results with Catit’s “Treat Ball” and PetSafe’s “Slim Cat” , but there are plenty more available. Other options for you are food puzzles, hide-and-seek games and, of course, the good old-fashioned “play with your cat for 10 minutes before every meal”—the latter being extremely effective, but not that welcomed by cat owners. Of course, you should not forget to provide your cat activity and attention at all the other times. There are many benefits of regular playing, petting, or even talking to your cat. IMPORTANT: There is no rule as to how much you should play with a cat. But there is a rule that, the more activity your cat gets, the less he will beg for food. Besides, playing is surely not the only activity available for your cat. It is likely that the most annoying thing you find about your cat begging for food is his meowing, purring, and walking beside you all day long. Your cat begs for food because he knows it either gives him food or your attention. We’re not even talking about not feeding your cat when he meows for food, or preventing your cat from stealing food in between meals. Even shooing your cat away or petting him will only reward his behavior and give him a glimpse of hope that “My human heard me and knows I want food, so if I insist more…” Don’t let that happen. Above all, however, remember that the main concern if your cat is hungry all the time is his health. Plenty of diseases are associated with this behavior, so you should not take it lightly. If your cat has put on some weight, you can find how to deal with obesity in cats here.